Say you are nervous about buying something like this "on the internet". One question might be: Why isn't the diamond GIA certified? We offer 1.00ct diamonds from $1795, on up to over $15,000. It would be quite unusual for us to offer a 1.00 diamond over $3500 without a GIA report. But the person spending $1795 does not necessarily want to spend an additional $300 for a GIA report- which is the cost in terms of GIA's price and time involved. Should you want to buy a more expensive diamond at some point in the future, we'll be happy to buy your ring back. Whatever questions you might have, we do not consider them to be a bother, rather an integral part of what we call customer service. KIDDING- there are no stupid questions. This is an important purchase, ask away. As you can see from these photos, the center diamond seems to have been injected with lemonade! 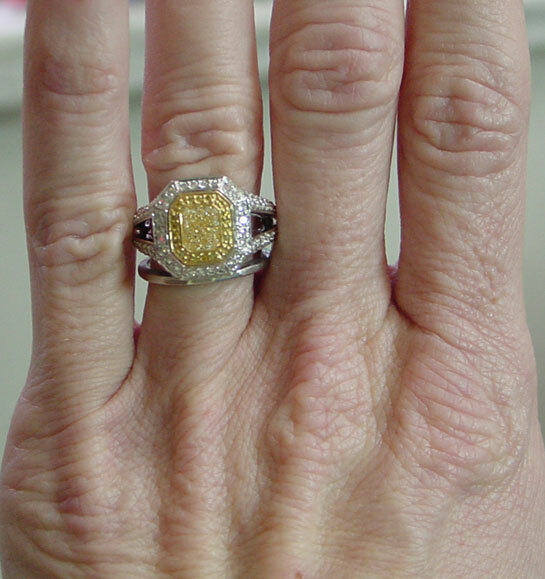 It's the effect of the perfectly executed bezel, and yellow diamonds around the center. The detail work is phenomenal. Besides the fact that the diamonds are set into a curved surface- the lovely design on the sides actually extends between the split shank opening on the side. Here's the most remarkable thing about this ring: It looks like it cost $15,000- no, $20k. I am very proud of this ring-100% of it's design and manufacture was done right here on 47th street.